I received an email this morning from my parents in Australia reminding me that I hadn’t yet sent them my upcoming travel itinerary, preferably with contact numbers for the hotels we will be staying at. You’re probably wondering why an independant 26 year old and her 31 year old husband would still be sending mum and dad a copy of their travel itinerary. Overbearing much? Not really. In 2012 Mike moved to Australia. During April of that year we went on a road trip into the middle of the Australian Outback with the intent of hiking the Larapinta Trail. That’s the only information we thought to leave with friends and family back home. On the Larapinta Trail. We were in the middle of nowhere. Who knows what could happen on our upcoming DTour of Central and South America. We’re planning on ziplining, white water rafting and bungee jumping in Costa Rica, kayaking out to deserted islands off Panama, sandboarding down the world’s largest sand dunes, and hiking to the top of a steep rock staircase known as the “stairs of death”. It’s all fairly safe with the right precautions, but who truly knows what could happen while we’re away. Leave your itinerary with someone you trust. Two weeks ago one of my close blogging friends was arrested in Egypt under false accusations of kidnap and torture. Thankfully we knew where he was, what his situation was, and he had friends and family working overtime to get him out. My point is, leave your travel itinerary with someone, or even multiple people, you trust. Let someone, anyone, know where you’re meant to be. It doesn’t make you any less independant, or any less “cool” – in the event that things go south you’ll have someone who can act immediately to aid and assist, or even attempt to locate you. Many countries have a smart traveler enrollment program where you can register an overseas trip with your government. In cases of natural disasters, civil unrest or other emergencies, your embassy will be able to assist you. Check your government website for more information. We have the same parents! 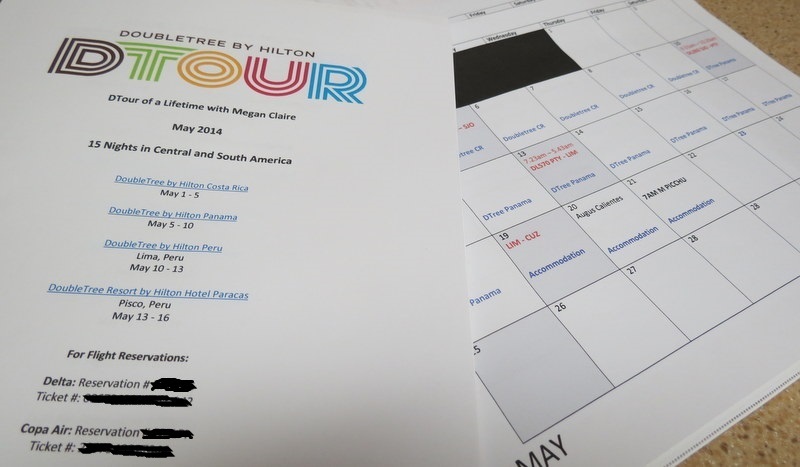 Mum and dad recently went around the world and you should have seen the organization which was put into the itinerary! A full binded folder with an A4 page dedicated to each day – it was amazing lol! Very good points and such a tragic tale to reinforce the issue. Before I leave on every trip my parents and wife seem to want to know all the little details. Thankfully my employer has the full itinerary and contact details too. It’s probably one of the most underrated travel tips – and one which you just don’t think about. Never a bad thing to have a safety net – information is a powerful thing! Advice we all should heed. My parents are always asking me what our plans are when we travel, it can feel a little bit like smothering, but I know it might the difference between life and death one day. And that’s what I tell myself as well. The guilt I felt about our Northern Territory trip when no-one could locate or contact us is something I’ll never forget. They didn’t even have to lecture me – the message sank in pretty hard! Great tips! Always important to think about safety–you never know what can happen. I usually leave m y itinerary with my parents. It’s nice to know someone has a vague idea where you are if something happens! I think this is a great tip that often gets overlooked even by seasoned travelers! Good advice even if you’re just taking a Sunday drive or going for a stroll around the corner. There have been plenty of peopke lost near home; it can only be exacerbated in remote areas. My Dad still always asks me for my itinerary and the hotel names etc – and funnily enough, now when my parents go away, I find myself asking them for the same thing! Travel safety is for everyone! Great tips Megan. We’ve been nomadic for nearly 18 months now and we never share deep details of our itinerary with our family. But recently we were trekking in the remote Amazon and it did cross my mind that they’d have no way of getting in touch if something happened. I think I’ll be def taking this advice on board and changing my ways. It’s just nice to know you have a backup, just in case. We feel like because we’re adults we need our independence etc, but it never hurts to just let someone know where we’re at and what’s happening. Sadly I think it’s one of those things that you never think about until something happens! Glad you’re taking it on board :) Happy and safe travels!! When travelling you can always cross regions that are in some way considered less safe (natural disasters, political or military conflicts, bombings, disease outbreaks, strikes, kidnappings or desolation of the area). Even if this doesn’t happen too you, the home front could think your in trouble, so I, just like you, always leave contact details and itinary at two places with family. And when going on a trekking in desolate area, I never go alone and I contact a local travel/rangers or police office and communicate my plans before leaving. This is certainly not overbearing. This is wise! Absolutely – in fact we were recently in Iceland when the Malaysian airliner was shot down over Ukraine. But of course because we’d been jumping from country to country so much, my family didn’t really have much of an idea where we were so sent the worrying messages just to make sure we were ok. We were 100% not in any danger, but the homefront didn’t know that. Glad to hear we’re on the same page!! Safe and happy travels/trekking!! Your travel blog information helps me a lot to write about travel, it gives such a great information which is very helpful. thanks for sharing such great ideas.